Turn your everyday purchases into 2% cash back* with the PayPal Cashback Mastercard®. Earn Cash Rewards every time you buy – all while enjoying No Annual Fee.1 Simply shop, earn and redeem. You must have an account with PayPal in order to apply for a PayPal Cashback Mastercard account. When you click "Apply Now", you will be prompted to log in to PayPal. If you do not currently have an account with PayPal, you will need to open one to apply. 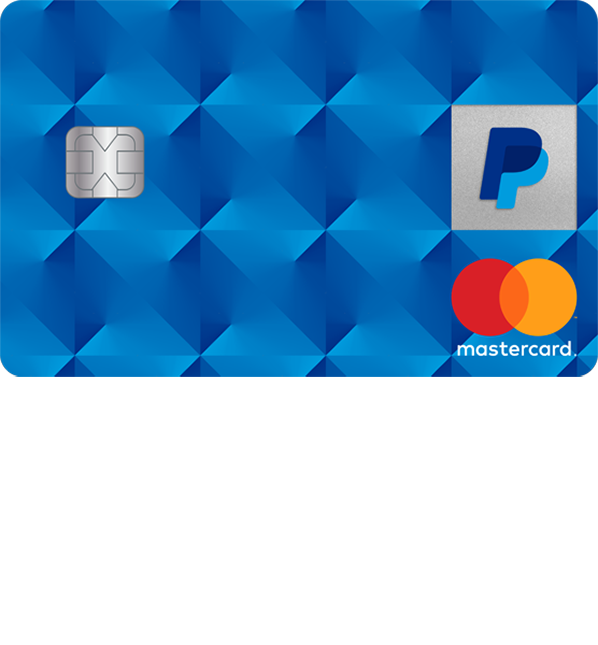 Use your PayPal Cashback Mastercard to shop everywhere Mastercard is accepted. No purchase restrictions. Get 2% cash back* every day, every purchase, every time you use your card. No exceptions. No rotating categories to keep track of. Redeem Cash Rewards right to your PayPal balance** -- start enjoying your rewards today! No redemption threshold. You deserve rewards for everything you buy. That's why we don't limit Cash Rewards to purchase categories or make you wait to redeem your cash back. From travel vouchers and retail to restaurants and hobbies, you can earn 2% cash back* almost anywhere and redeem your Cash Rewards whenever you want. You can relax and enjoy. You're getting Mastercard benefits. Double the original manufacturer's or store brand warranty for up to one year when you purchase using your PayPal Cashback Mastercard. If you buy an item with your card and the price drops within 60 days, you may be reimbursed for the difference. You'll get ID theft alerts, credit card replacement and ID Theft Affidavit assistance if you're the victim of identity theft – at no cost to you. EMV Chip Technology makes shopping more secure at chip-enabled terminals around the globe. See Mastercard Guide to Benefits for details. Get rewarded for every purchase. The ways you can use your PayPal Cashback Mastercard and earn Cash Rewards are almost endless. Start earning 2% cash back* on every purchase. You must have an account with PayPal in order to apply for a PayPal Cashback Mastercard account. When you click "Apply Now," you will be prompted to log in to PayPal. If you do not currently have an account with PayPal, you will need to open one to apply. *Purchases subject to credit approval. See Rewards Program Terms for details and restrictions. To earn Cash Rewards, you must have an open account with PayPal in good standing to which your Card Account is linked. If your account with PayPal is closed for any reason, or if your Card Account is no longer linked to PayPal, your Card Account will be closed and any Cash Rewards earned, but not redeemed, will be forfeited. **Important information on redeeming Cash Rewards to your PayPal balance: You need to have a PayPal Cash or PayPal Cash Plus account to have a balance. If you do not have one of those accounts, you can only transfer your Cash Rewards to your bank account or debit card linked to PayPal. 1For New Accounts: Variable Purchase APR is 22.24%, 26.24% or 29.24%. The APRs are accurate as of 1/1/2019 and will vary with the market based on the Prime Rate (as defined in your credit card agreement). Minimum interest charge is $1.50 for all types of cards in any billing cycle in which you owe interest.